The phrase “you are what you eat” takes on new relevance when we explore a people’s gastronomic habits as a way to better understand them and their culture. This is also one of the most enjoyable ways of becoming acquainted with a people, especially when these people are the Basques. Basque cuisine enjoys a renowned reputation, both in Europe and many others corners throughout the world. It is good food and fun to eat. 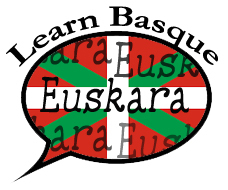 Perhaps you have had occasion to sample Basque cuisine, most likely in a Basque-American restaurant of which there are literally dozens throughout the United States . There is a difference, however, between the characteristic Basque cuisine of Euskal Herria and what we are accustomed to here as being Basque food. Meat represented a regular staple of the traditional American diet, yet the same did not apply in the Basque Country. European Basque cattlemen and sheepmen had more difficulty acquiring ample pasture for their livestock in the narrow mountain valleys and plains. The result was higher prices but also leaner, tastier meats that while short on quantity delivered high quality. Pork livestock equally plays an important and often surprising part in traditional Basque cuisine. While the earth provided limited resources, the sea offered more abundance. Seafood is what accentuates traditional European Basque cuisine. It is these recipes that have garnered international fame. The varied assortment of North Atlantic fish is simply broiled or prepared in one of the many notable sauces that typify traditional Basque cuisine. Then to road out the meal, there is always an ample supply of bread, some good wine and cheese for dessert. Basque-American restaurants incorporate elements of this European tradition with their American context. There are various reasons for this; e.g., lamb is a Basque favorite here because of the traditional importance of the sheep industry in the history of the Basques. Lamb is usually the main entree at most Basque picnics. In addition, American cuisine has always accented meats and Basque-American restaurants adapted themselves to their clientele. 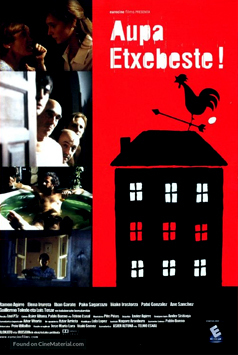 Finally, the “family-style” serving derives from the Basque-American tradition of the boarding houses. The hearty platters of food were readily consumed by the young Basque immigrants who earned their living with long hours and arduous work. Thus the American context added new elements, but traditional staples remain. Many restaurants and Basque clubs continue to serve Basque delicacies for the daring diner that include “tripota / morcilla” or blood sausages, “txerri patak” or pigs-feet, and of course “Rocky Mountain Oysters.” Hungry yet? Hopefully you are near a Basque restaurant. There are also numerous Basque cookbooks that are available to get you started. On egin! Enjoy! This New York Times article originally appeared online at www.nytimes.com/indexes and is reproduced here in case it is re/moved. The J. T. Basque Bar & Dining Room, in Gardnerville, Nev., was hopping at lunch, with the bar and slot machines in action and ''Got Picon?'' T-shirts ready for sale. The long tables were filled with locals who satisfied my main road-food rule: always choose the restaurant with the greatest number of pickup trucks in the parking lot. The drink of the day was Picon punch, spiked with grenadine, soda, a twist of lemon and a brandy float — an acquired taste, to be sure. On the menu were sweetbreads by the cup and a crumbly house-made Basco Burger, but I had come for the full Basque dinner: garlic-topped lamb shoulder steak, thinly sliced and pleasantly greasy, accompanied by an unlabeled bottle of sweet-tart house wine. In the 1840s, when Basque immigrants arrived in the American West, they came for the gold. But in the end, they stayed for the sheep. Having found steadier work as shepherds — the Basque have a long tradition of agrarianism in their tiny homeland in northern Spain and southwest France — they spread out from California, mostly into Nevada, Idaho and Oregon. They spent months alone in the scrubby mountains and sagebrush plains, taking their sheep to towns like Winnemucca and Elko, in Nevada, to sell them along the railroad lines. Basque-run boardinghouses sprang up to accommodate the shepherds, with rooms upstairs and a bar and dining room downstairs. Some 300 dotted the western landscape at their height, says Pedro Oiarzabal, a Basque scholar at the University of Nevada, Reno. But over the years most Basques earned enough money to return home, and today only a handful of the boardinghouses remain. The real work of preserving Basque culture is now the domain of clubs and festivals organized by the original shepherds' descendants. And while the roadhouses no longer let rooms (''but there might be an upstairs,'' Oiarzabal says), they still run restaurants. These down-home joints in and around Reno — heading east on Highway 80 — provide the last, best place to taste one of the country's singular culinary hybrids, the legacy of more than 150 years of shepherd-meets-cowboy rural cooking. The Santa Fe Hotel Basque Restaurant in Reno, NV. Names like Santa Fe (per the railroad) are common because many early Basque boarding houses were situated alongside the railroad making it easier for new Basque arrivals to find their new "home away from home." 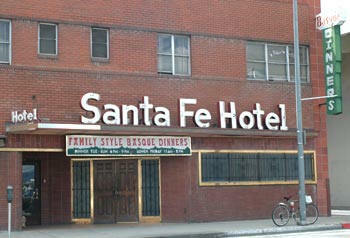 When I arrived in Reno, I headed to the Santa Fe Hotel, which sits on a relatively neon-free block downtown. Rebuilt after a fire in 1948, it's an un-self-conscious time capsule: the bartender still uses the old rotary telephone and cash register when not mixing the Picon punches that are ordered by the round as soon as the doors open at 5 p.m. Family-style dining is a Basque boardinghouse tradition — ''How else to feed 200 hungry men at a time?'' Oiarzabal says — so I was seated between a trio of environmental workers and a father-son-friend group. The initial awkwardness was cut by the fact that the environmentalists were already on their second bottle of wine. Soon enough, out came a big bowl of pasta soup in peppery beef stock; red beans with thyme; garlicky iceberg salad; tender, tomatoey oxtail stew; seafood paella; and French bread and butter, all served on mismatched cafeteria ware. And those were the starters. At a Basque restaurant, the only thing you order is your entree — usually lamb or steak — and even then, there's so much to go around. Lomo (breaded pork cutlets with red peppers) and steak were plunked down on the table, along with a pile of six double-cut lamb chops that two of us had ordered. They were rare, meltingly fatty slabs garnished with crispy garlic — by far the best lamb of the trip and, at $22, the second most expensive thing on the all-inclusive menu (after the 14-ounce rib-eye, for $24). There are a handful of Basque restaurants on the shabby outskirts of Winnemucca, one of the most significant Basque sheepherding settlements in the 1870s because of its intersecting railroad lines. 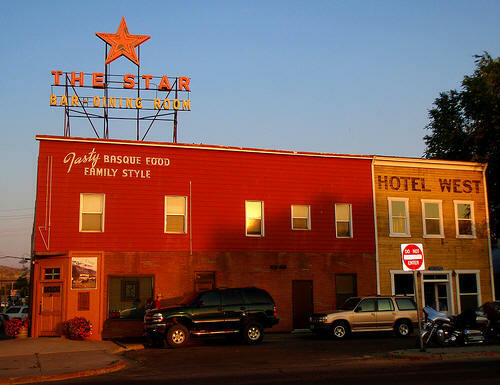 In the 1950s, Interstate 80 went through downtown, bringing tourists; but in the '70s the Interstate was rerouted to bypass the town, by then a ranching, mining and minor gambling depot, and business withered. 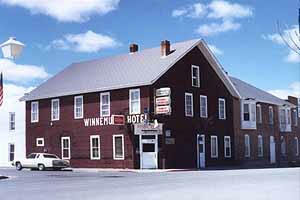 The Winnemucca Hotel, established in 1863, looked to me as if it hadn't been touched in more than a century: a gorgeous carved-wood bar from the 1850s, sun-faded beer signs and photos, a beautiful old-fashioned kitchen. The mood was party in the front, business in the rear — the bar seemed like a great place to have a chorizo sandwich and get into trouble with ranchers, while the dining room had a church-basement appeal, with brown wainscoting, droopy ceiling tiles and mismatched chairs. I befriended a road-tripping family over beefy onion soup, highly satisfying paella, beans with cheese and tomato, and a platter of mystery meat (half of us thought it was pork, half beef; we drew straws to see who got to ask the combat-boot-wearing cook). It wasn't the best meal I had in Nevada, but like the too-sweet wine in the unmarked bottle, it was a triumph of atmosphere. 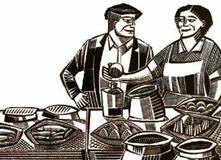 It's up for debate just how much America has eclipsed Basque Country in these kitchens. 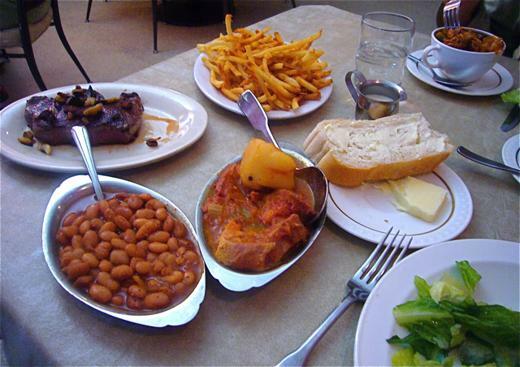 Rebecca Moyle, who teaches history at the University of California, Berkeley, and has eaten this food since childhood, says, ''Old-fashioned Basque places often serve you the whole animal over the course of the meal — tripe and organs in the soup, tallow and bacon in the beans, sometimes liver or even tongue. But I've noticed over the last decade that fewer restaurants are doing soups with the tripe or showing liver on the menu. And I haven't seen tongue for donkey's years.'' It's true that for many diners at Basque restaurants, culinary authenticity isn't an issue. These are as much local hangouts as tourist curiosities, and what makes them uniquely popular are the few remaining elements of Basque boardinghouse culture: huge platters, low prices and plenty of camaraderie.